My friend Beth at Walksonstilts and I have spent many a writing conversation musing about the power of the postcard. Writing a good postcard is no easy feat. Receiving a good postcard is one of life’s best simple pleasures. And from a writing perspective, the postcard is the ultimate practice exercise. It insists on brevity. It invites levity. It loves a good image. The postcard. 1 picture, 50-100 words. I’m going to start posting more postcards to this blog. Feeling broody on group trip to Assateague Island. My solo wanderings sabotage new friendship odds, but I can’t befriend the girl who wore fake eyelashes to the beach. Not today. 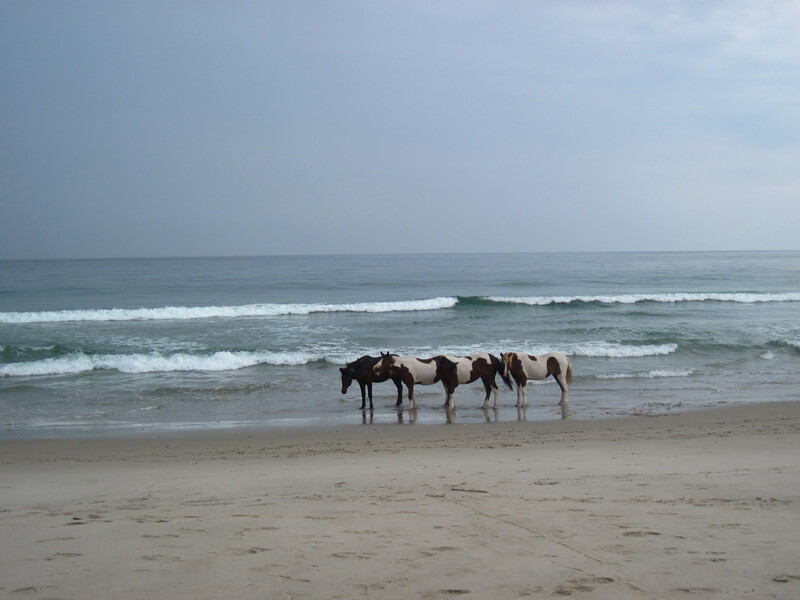 Wild horses on a crowded beach prove the elegance of indifference. Sand sips water, and I remember why I always walk along the surf, at the collision of textures. More postcards: from the Billy Goat Trail, from the bare woods. I should tell DO! But I can’t take credit for the postcard idea…I’ve heard of it once or twice in writing classes, as a play exercise, and figured it would make a fun blog exercise. Always trying to do more play and more short writing!